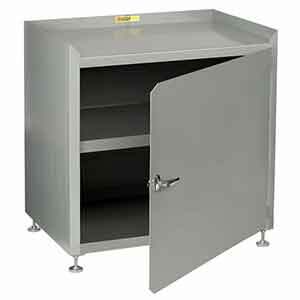 Constructed from heavy gauge steel with a locking door handle for security, this cabinet can hold up to 2,000 lbs. and features a center shelf for more organized storage of documents or small valuables. It sits on leg levelers, which adjust to keep the cabinet even on uneven floors, or to raise and lower its overall height. The top of the cabinet may be used for extra storage; the 2" upturned lips on the back and side edges help retain items. Cabinet ships fully assembled and ready for use. D x W: 18" x 18"
Height to Top Shelf: Adjustable 31" to 34"